A small group of Greater Flamingos flying overhead in the Camargue in the Bouches du Rhone region of Provence, France. Flying Greater Flamingos, Phoenicopterus roseus, Parc Naturel Regional de Camargue, Plaine de la Camargue, Camargue, Les Bouches du Rhone, Provence, France, Europe. 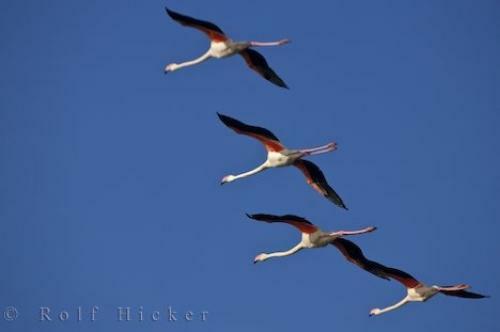 Photo of four Greater Flamingos flying in the Plaine de la Camargue, Bouches du Rhone, France. Pictures from photo gallery "Bird Pictures"
This picture is part of the photo album "Bird Pictures" - there are more beautiful images waiting for you.